Revitol Acnezine Cream is a thoughtful formulation of natural ingredients to provide your skin all the necessary healing abilities. 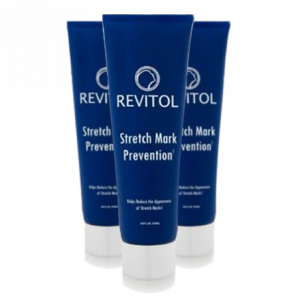 Revitol acne solution can help you get rid of the ugly looking acne and have a clear, flawless skin. 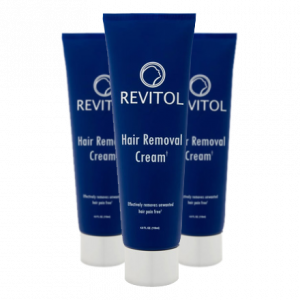 Revitol Acnezine Cream unblocks the hair follicles clogged with oil, thus it stops acne from forming. It also checks other problems like blackheads, whiteheads too to let your skin breathe and remain clean and clear. It combats bacteria and other toxins contributing to acne formation. Of all the techniques that you probably have been using so far to treat your acne are primitive (no scientific backing), dangerous and harmful for the health of your skin. 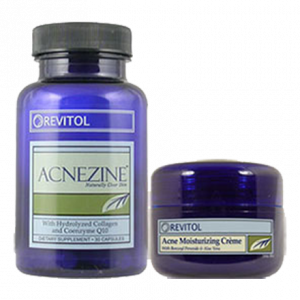 Acnezine Cream by Revitol is different from all of them; Revitol cream doesn’t cause any tingling, burning sensation and does its work quietly. Active ingredient: Benzoyl peroxide, Vitamin E, Collagen and Aloe Vera. Inactive ingredient: Bilberry Extract, Glycerin, Green Tea Leaf Extract, Honey, Lemon Peel Oil, Orange or Neroli Fruit Extract, Organic Aloe Vera Leaf Juice, Sage Leaf Extract, Tea Tree Leaf Oil, Sugar Cane Extract, Tea Tree Leaf Oil, Willow Bark Extract, Witch Hazel, Water and more. 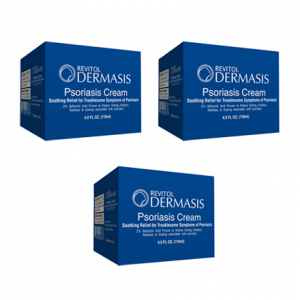 Most of the ingredients are natural extracts and so the chances for side-effects become minimal. But before applying Revitol Acnezine Cream, clean your face thoroughly and then apply a thin layer of the cream. It provides hydration and should be applied only once in a day, in the beginning. Later on, it can be applied more than once in a day. It takes care of the blemishes already present and also checks any future breakouts-to-be. 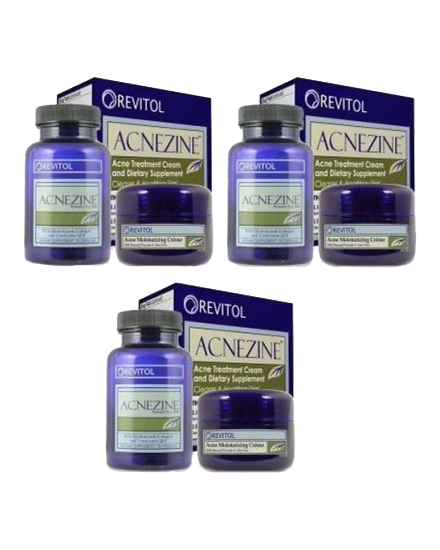 Apply Revitol Acnezine Cream for a minimum of three months to sustain the results you receive. BUY 2 BOTTLES, GET 1 FREE for $26.63/each! Excess of sebum production accompanied with unavailing exuviation of dead and dry skin leads to the formation of acne. Some of the common types of acne include pustules, papules, cysts, comedones, and nodes. A number of factors are responsible for this skin condition which also includes hormones and lifestyle issues like stress. Though some are insignificant, some can cause nuisance in the form of pain, inflammation, and pus draining out. Some active and some inactive ingredients make Revitol acne cream a competent acne product. I love this amazing product,iIt not only helped me get rid of my acnes, but It made my skin even better. I would recommend it to all those who are suffering from acute acne problem like me. 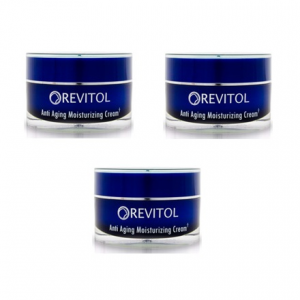 Most of the topical acne treatments are drying, but Revitol acne cream is different. It treated the acne pretty gently and made the blemishes go in just a few days. Love, love, love it. I use Revitol Acnezine Cream on my face and my back, because sometimes I break out on my upper back and it can be really embarrassing during the summer. 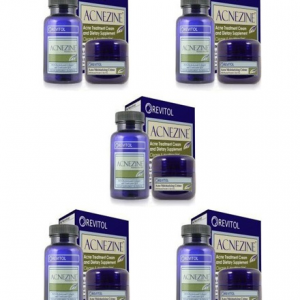 Every time I used acnezine, my face clears up within a few days and it’s left soft and wonderful. But Revitol is always sold out? Make more make more!